APH Birmingham is an off-airport car park which is located only 15 minutes from the airport. The car park offers efficient transfers which run 24 hours a day as well as assistance, upon request, for passengers to help load luggage on and off the coaches. 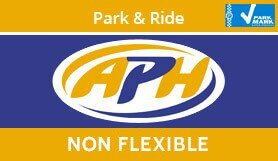 APH are unable to accommodate bikes, surf boards or items of similar size on their transfer coaches. Please arrive at the car park 45 minutes prior to your check in time to allow for transfer. The car park must retain your keys. Minimum stay/charges may apply at this car park at certain times of the year. Additional charges may be payable upon check in for over-sized vehicles. Non Flexible option - bookings made at this special price cannot be cancelled or amended. On arrival at car park please report to Reception and present your confirmation together with your car keys.Reception will also require confirmation of your car registration, return flight number and landing time. Exit Toll at J2, turn right and follow signs for Coleshill (then from J9). From South (M5 & M40), Wales and NW (M6 South) via M42 North: Exit M42 at J9 signed A446, RH lane (then from J9). Take M42 North, exit at J9 signed A446, RH lane (then from J9). Take the exit signed A446 and Coleshill, turn left at next (Hams Hall) roundabout, left at roundabout, APH is on the right. On arrival at car park please report to Reception & present this confirmation & car keys & any immobilizer /alarm codes.